Red Knot at Raybins Beach near Fortescue, New Jersey, by Joshua Galicki. After a three and one-half hour, early morning ride, we spotted the modest wooden sign which confirmed that we had reached our shoreline destination on the New Jersey side of lower Delaware Bay. Buttressed by a driftwood stump, the sign stated, simply: “Shorebird Viewing Area.” We quickly parked and fumbled for binoculars and spotting scopes. The open car door ushered in a waft of warm, spring air and something more: the incessant chatter of birds. A short dash (on stiff legs), across the road and a peek around a small dune revealed the source — several thousand Red Knots, Ruddy Turnstones, and Semipalmated Sandpipers scurrying about the middle and lower parts of the beach in a full-fledged feeding frenzy. Horseshoe crabs were en masse too; several rows deep on the beach, rocking in the silt-laden waves, they were reminiscent of a flotilla of landing craft. It seemed like a chaotic free-for-all, but at a deeper level it was actually a wonderful spectacle unfolding with exquisite precision. Each year in May, millions of horseshoe crabs emerge from Delaware Bay to create the next generation. The smaller males move into position first and wait. Females then move up and the competition begins as males vie to complete the pair. The successful male grasps the female from behind with special claspers (a telltale way to identify the sexes) and is dragged up the beach. Near the high-tide line, the female lays as many as 75,000 green-brown eggs, a few inches deep in the sand. Then it’s the birds’ turn. Like planes at an international airport, they arrive from exotic, far-off places: Ruddy Turnstones from Brazil, Semipalmated Sandpipers from neighboring Suriname and Guyana, and Red Knots that wing in from as far away as Tierra del Fuego, the southern tip of South America. They drop onto the beaches with fuel reserves nearly spent, many having flown nonstop for 40 to 60 hours. For the next few weeks they’ll eat at a frantic pace, gorging on the abundant eggs, some birds doubling their weight in the process. Activity peaks in May with tens — often hundreds — of thousands of shorebirds packed onto suitable beaches on both sides of the Bay. 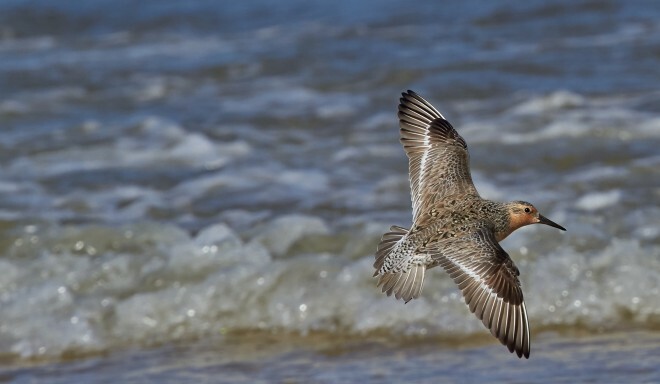 By the time the last few lift off, cartwheeling toward their arctic breeding grounds, more than one million shorebirds will have funneled through the Bay, including more than 75 percent of the East Coast’s Red Knots. 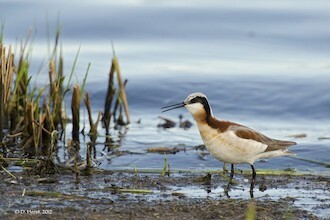 Wilson’s Phalarope at Murray Marsh, Edmonton, Alberta, by westcoastbirder. At another “staging site,” Cheyenne Bottoms — a 20,000-acre, state-owned wetland complex in central Kansas — the percentages can be even higher. More than 90 percent of all White-rumped, Baird’s, and Stilt sandpipers, Long-billed Dowitchers, and Wilson’s Phalaropes pass through the Bottoms. The West Coast too has staging sites that migrating shorebirds depend upon. Census-takers with the Point Reyes Bird Observatory in California estimate that up to 750,000 Western Sandpipers use the lower part of San Francisco Bay for a few short weeks each spring. The grand prize, however, must go to the Copper River Delta in Alaska, since it provides a key fueling stop to 20,000,000 shorebirds, predominated by Western Sandpipers and Dunlins. While ornithologists have known for several decades that shorebirds are long-distance migrants (Hudsonian Godwits and Red Knots are known to fly 15,000 miles round-trip on their annual journeys between wintering grounds and breeding grounds), they knew relatively little about other characteristics of migration. Many assumed that shorebirds migrated in a “hopscotch” pattern, stopping to feed at any number of suitable sites, resulting in an even distribution along migrational routes. This belief began to change in the mid-1970s due to the data generated from the International Shorebird Survey (ISS), initiated by the Manomet Bird Observatory (MBO) in Massachusetts. ISS data indicated that shorebirds use sites preferentially, targeting a handful of locations during migration, avoiding intervening areas which may appear suitable. 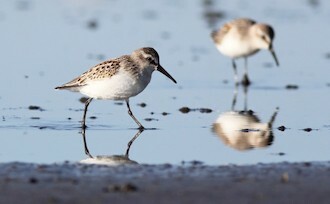 An intensive, five-year survey of the entire South American coast by the Canadian Wildlife Service, recently published in atlas form (Atlas of the Nearctic Shorebirds on the Coast of South America, Canadian Wildlife Service, 1989), confirmed the same “staging” behavior of shorebirds on their wintering grounds. Unfortunately there is no shortage of activities that threaten to break the chain. Delaware Bay is one of the busiest shipping channels on the East Coast for petrochemicals and even though New Jersey and Delaware have a spill emergency response plan, the specter of oil-laden waves lapping the beaches where shorebirds concentrate in the spring is quite real. The recent oil spill from the Exxon Valdez, in March of 1989, was sufficiently close to the Copper River Delta to give biologists anxiety attacks. At Cheyenne Bottoms, Kansas, as in other areas of the arid midwest where water is limited and there is competition for its use, water quantity, not quality, is the concern. Although the state has senior water rights for the Bottoms (a guarantee of 50,000 acre-feet annually), it has been lax in enforcing these rights. As a result, hundreds of upstream irrigators have been pumping the Ogallala aquifer at such a rate that the Arkansas River, which depends on the aquifer for replenishment, is a dry riverbed by the time it passes the Bottoms. Loss of river water leaves precipitation as the only source for filling the pools. The worst fear of biologists — drought — came true in 1989. Because so little rain fell during the first part of the year, by late spring Cheyenne Bottoms had dried out. Thousands of fish and turtles died. The fate of thousands of shorebirds that arrived at the shrinking pools remains unknown. “Because of the drought some 50,000 birds — Baird’s and Semipalmated sandpipers, and Long-billed Dowitchers — weren’t able to put on enough fat; they only had enough to fly halfway to their breeding grounds,” notes Gonzalo Castro, a staff researcher with MBO studying shorebirds at Cheyenne Bottoms. “I looked at several areas nearby but couldn’t find the birds feeding. I don’t know what happened to them,” he says. The drought also jeopardized over 100,000 White-rumped and Stilt sandpipers passing through later in the season. By the time they arrived the pools had disappeared. Some threats to staging sites are less apparent. At San Francisco Bay National Wildlife Refuge, shorebirds refuel on a host of prey species: polychaete worms, amphipods, small clams, and in salt ponds, brine flies and shrimp. In 1986, researchers from the Point Reyes Bird Observatory discovered a new clam — Potamocorbula amurensis (it has no common name) — in the bottom of the lower Bay. “It seems to be displacing other bottom-dwelling invertebrates and could disrupt the food chain in the Bay,” contends Gary Page, director of coastal and estuarine research at Point Reyes. Western Sandpipers at Boundary Bay, Delta, British Columbia, by Liron Gertsman. As at other staging sites, destruction of wetland and shoreline habitats is an immediate problem facing the Bay. Salt marshes and ponds and mudflats surrounding the Bay provide critically important feeding sites, but, unfortunately, marshes and ponds have been hard hit by development. 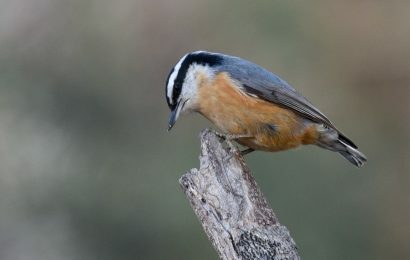 “Birds have high metabolic rates, particularly during spring migration, and they have to keep feeding,” Page explains. “At low tide, they use mudflats, but during high tide, salt ponds provide alternate feeding habitat.” Loss of salt ponds, Page fears, might result in shorebirds not being able to build enough fat reserves to complete migration. But there is a fair share of good news on the shorebird conservation front as well, and much of it is embodied in the acronym WHSRN: the Western Hemisphere Shorebird Reserve Network. Referred to as “wissern” by those in the business, the Network was founded in 1985 to draw attention to the conservation needs of shorebirds and the wetlands on which they rely. Included in this cooperative, international program are the U.S. Fish and Wildlife Service (USFWS), Canadian Wildlife Service, several dozen state wildlife agencies, MBO, and the National Audubon Society. Full-time staff for WHSRN is provided by MBO at its Massachusetts office; a South American office will open in Buenos Aires, Argentina, in early 1991. Eight countries currently are participating in the Network: United States, Canada, Brazil, Suriname, Chile, Venezuela, Peru, and Argentina. The nomination and inclusion of shorebird staging areas as reserves in the Network are key elements of WHSRN’s mission. Currently there are four types of sites: “hemispheric” (containing 500,000 or more birds or 30 percent of a flyway population), “international” (100,000 or more birds or 15 percent of a flyway population), “regional” (20,000 birds or 5 percent of a flyway population), and “endangered species” sites (no minimum numbers of birds or percentages). In 1985, Delaware Bay was the first site designated; to date, nine other hemispheric and three international sites have been included. The hemispheric sites are: Bay of Fundy, Canada; Bigi Pan, Coppename, and Wia Wia, Suriname; Laguna Mar Chiquita, Argentina; Cheyenne Bottoms, Copper River Delta, San Francisco Bay, and Stillwater (Nevada), United States. The international sites are: Lagoa do Peixe, Brazil; Maryland/Virginia Barrier Islands and Mono Lake, United States. More than 30,000,000 shorebirds are protected by the sites currently included in WHSRN. This impressive number will grow: nearly 200 additional sites have been nominated, 52 from the USFWS alone. 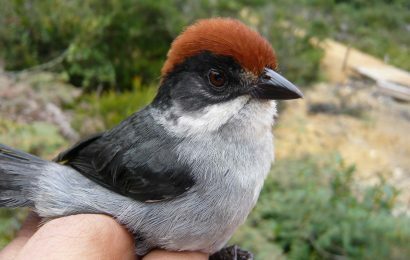 WHSRN has taken an additional step by designating “sister reserves” — sites connected through their use by the same birds. For example, the Bay of Fundy and the three sites in Suriname have been “paired as sisters,” since Semipalmated Sandpipers which use the Bay as a fall staging site overwinter in Suriname. The governments of Canada and Suriname work together as well, with the Canadian Wildlife Service giving financial and technical support to Suriname to help develop management plans for its WHSRN reserves. Additional “sister reserves” are expected to be established. The WHSRN Council, a 10-member group, meets every six months to consider candidate sites and to discuss problems and issues facing member sites. “The Council is designed to steer the operations of the WHSRN program and has focused on trying to recruit additional important shorebird sites into the Network,” explains Dr. George Finney, council chairman and director of the Atlantic Region of the Canadian Wildlife Service. But WHSRN does much more to safeguard shorebirds. “In South America, we’ve been developing a network of agencies and experts on shorebird and wetland conservation issues. We’ve sponsored workshops on these issues in several countries and helped sponsor a management plan for Bigi Pan in Suriname. At Stillwater National Wildlife Refuge and Cheyenne Bottoms, WHSRN has been a cheerleader on water rights issues,” Finney says. The designation under WHSRN has been a significant reason Congress appropriated nearly five million dollars to acquire water rights at Stillwater, he adds. “Inclusion in WHSRN helps promote protection of the site,” says Castro, who in addition to his research capacity at MBO, serves as program manager for the Network. “There is nothing legal or binding to the inclusion, but once sites are designated we can use the designation as moral suasion,” he points out. An important aspect of WHSRN has been in helping identify priority acquisitions to the National Wildlife Refuge (NWR) system. For example, in October 1988, Congress authorized the USFWS to purchase 20,000 additional acres at San Francisco Bay NWR, primarily in the lower reaches of the Bay to safeguard shorebird feeding areas from encroaching development. “The threat to seasonal wetlands, such as salt ponds used by shorebirds, by industrial and residential development, gave rise to a ‘Complete the Refuge’ campaign,” explains Rick Coleman, refuge manager of the San Francisco Bay Refuge Complex, which includes San Pablo NWR at the Bay’s northern end. Several hundred miles farther north at Gray’s Harbor, Washington — a site proposed for hemispheric status due to the presence of 800,000 or so hungry Western Sandpipers for a few weeks each spring — Congress established Grays Harbor NWR. In 1988, it was the first refuge established primarily for migratory shorebirds. When complete, the refuge will encompass 1,800 acres in the harbor at a place known as Bowerman’s Basin. The basin is targeted due to the fact that, though it makes up only 2 percent of the harbor, it serves 50 percent of the shorebirds that utilize it. The USFWS has bought a key, 68-acre parcel from the city of Hoquiam and is in the process of preparing a management plan for the refuge. Key features of the plan are a proposed visitor center with exhibits and dioramas interpreting shorebird migration and ecology, and a series of boardwalks and observation platforms. Back on the East Coast, on the New Jersey side of Delaware Bay, the USFWS is proposing to buy 15,300 acres to establish Cape May NWR, including several thousand acres of bay front containing beaches frequented by shorebirds. Federal acquisitions will complement the prior efforts of the New Jersey Natural Lands Trust which has bought over three miles of shoreline totaling more than 1,000 acres; the Trust is currently in negotiation on an additional 36-acre shoreline parcel. With more people coming to see the shorebird spectacle each year, land acquisition isn’t enough to protect the birds. For the past two years, the New Jersey Endangered and Nongame Species Program and the Cape May Bird Observatory have operated a successful shorebird warden program using students from Stockton State College in Pomona, New Jersey. The purpose of the program is to minimize human disturbance to shorebirds during their critical feeding period; wardens do this by patrolling select feeding beaches, distributing literature to beach-goers about the horseshoe crab egg/shorebird connection and the need to allow the birds to feed undisturbed. 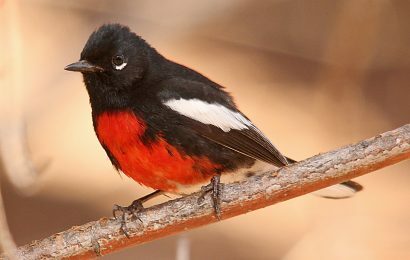 “Shorebird migration highlights how different nations are truly connected through their wildlife,” says Morrison. WHSRN has worked so well because it recognizes, indeed capitalizes, on this international interdependence, and, as a result, serves as a model program in migratory bird protection. As more sites are included in this hemispheric network, protecting more links in the chain, the delicate balance is tipping in favor of shorebirds. One of the many responsibilities John Turner has as director of the Division of Natural Resource Management for the Suffolk County Parks Department in New York, is the management of bird sanctuaries. Turner, who participates in many birding trips and also enjoys hiking, has been published in Defenders, Newsday, and The Conservationist.